Sparklines allow you to show, in a very small space, what is happening to a row or column of data. But they tend to group themselves as shown by the blue box that appears when you click on one of them (see below). The end result is that if you try and just change one of them (e.g. from a line to a column sparkline) they all change i.e. they are grouped and what you do to one happens to all. 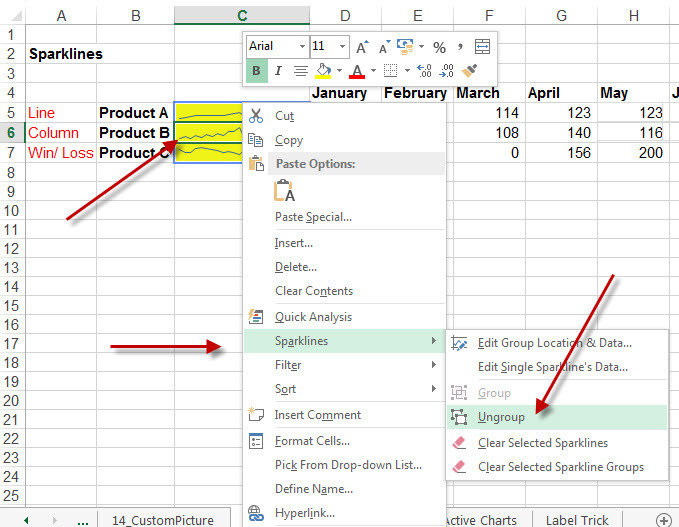 To ungroup sparklines in Excel and stop this from happening, all you need to do is right click on the cell you want to change, choose Sparklines, and then UNGROUP. Once this is done, you will be able to make changes to the one sparkline without affecting the other sparklines.